Our goal is to build custom granite countertops of exceptional quality that surpass not only industry standards, but your expectations as a homeowner. From start to finish of your project, our experience and approach to business allows us to give you the most professional service available with outstanding results each time. From our first meeting to your installation, we promise to provide the best customer service possible, informing and communicating closely with you throughout the entire process. All of your concerns and questions will be addressed promptly, and we will do everything we can to ensure that your granite project experience is a pleasant one. You will be treated with the care, concern and respect you deserve. Why is Your In-home Selection so Important? Viewing granite in a variety of positions, alongside your cabinets, flooring, decor, and most importantly, the natural and artificial lighting of your home, is essential when selecting your granite countertop colour. Granite slabs stored vertically in warehouse lighting don't look the same once installed horizontally on your cabinets. Experiencing the colour, shade and dye-lot of the actual material in your home, before it is fabricated and installed, is so important when making such an investment, and to the enjoyment of your granite for years to come. Your service begins with a personalized, in-home consultation, where you are presented with a stunning selection of colours, direct from Northern Ontario's largest inventory of granite slabs. This step allows you to view a wide variety of granite samples alongside your cabinetry (or cabinet sample), flooring, paint, décor, and most importantly, with the natural and artificial lighting in your home. NMG's large (14” x 20”) granite samples are cut directly from our in-stock slabs, allowing you to see exactly how the colour you choose will look in the lighting of your home. Once you have narrowed your selection, we offer slab viewing by appointment at our shop in Temagami, to ensure you are provided the proper attention you deserve. Northern Marble carries over 150 slabs in inventory, ensuring on-time delivery and installation of your superior quality custom fabricated countertops. 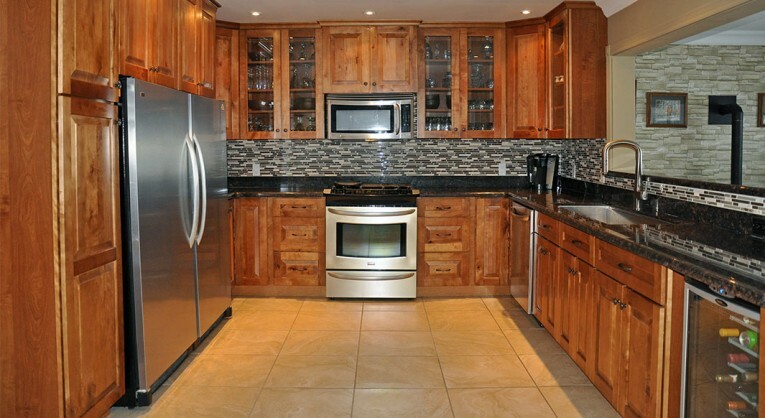 Each slab is hand-selected for the finest grade and quality of granite available. The first step to a new countertop set is an in-home consultation. To make sure that we are both on the same page, please take a moment to submit the following consultation request form. One of our staff members will be sure to get back to you in timely fashion. Your no obligation estimate includes choice of granite colour, edge profile, all hole cut outs, fabrication, delivery, installation, premium UV grade impregnating sealer and warranty of your granite countertop. Templates are taken to ensure a perfect fit, and your countertops are custom fabricated at our family operated shop in Temagami. 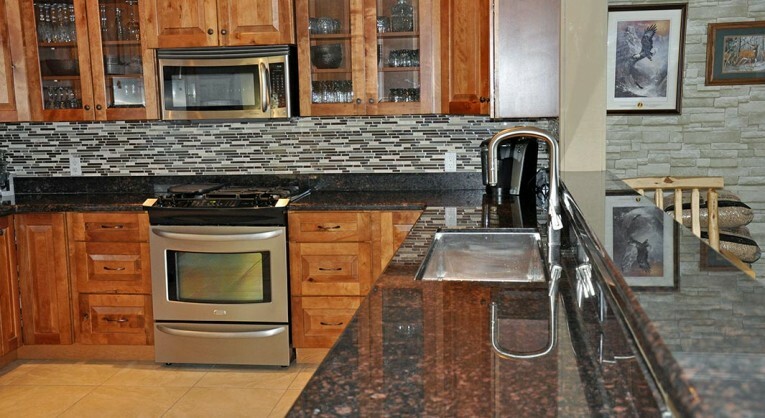 Your granite countertops are professionally installed, on time, and we proudly warranty our work. We stand proudly behind our guarantee that your granite countertop will not stain, and, you will never have to re-seal it again! As a point of pride and professionalism at Northern Marble And Granite, we’ll never install something we wouldn’t have in our own home. As such, we seal each and every project before it goes out the door.